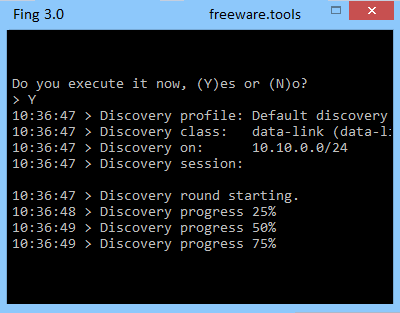 Fing is the command line tool for network and service discovery. Taking advantage of a brand new cross-platform network engine, it reaches an impressive discovery sharpness and speed: you're going to discover your whole network in few seconds and generate customized real-time reports. The network discovery provides you a complete view of any network in a very short time Fing smart discovery automatically detects the network type and uses the best technique to take the picture of it. In short, Fing is a tool whose main purpose is to help users to scan their network, find all the connected devices and display information such as IP and Mac address. Fing is a useful and reliable command line utility specially designed for users who need to get a complete picture of the network they are connected to, including IP and Mac addresses, device vendors, ISP location and connected servers. The main purpose of Fing is to discover and ping all the connected devices. The best and accurate results can be achieved using an Ethernet and Wi-Fi network, where the application can take advantage of a special discovery engine with an impressive speed. After that, all the generated results can be easily shared via e-mail and in various formats so they can be easily integrated within any application. Fing performs a deeper analysis through all the ports. Still, you have the possibility to even define your own service. Moreover, Fing automatically detects the network type and enables you to audit active services on any host. Nowadays, as we all are aware of, all the devices are connected through a common network. For example, we connect our smartphones, laptops, tablets and game consoles to the same Wi-Fi network. By using Fing, we are able to identify all these devices including addresses, names and manufacturers. On an ending note, Fing analyzes your network, translates a domain name into IP address or vice versa and wakes up devices that may be switched on from the network.